If you could write a letter to your teenage self and only use 5 words – what would you say? And my sister, who started it all finished it with “You’re stronger than these trials”. It was an exercise surprisingly more fun than I expected! And I loved reading the responses from the rest of the family! In other news, I have my great grand-parents antique high boy dresser (I forgot to take a picture before I started sanding!). This lived in their garage, so it’s not in good shape. But it’s got great character! And I’m sure it was my sister that graffitied the inside! The dresser is all sanded down and my original plan was to stain and seal it, since it’s missing one knob, I can’t restore it and since it is just going to live in my guest room, it doesn’t have to be a show piece. Come to find out, it’s good news that I can’t restore it, and that it doesn’t need to be a show piece because when I sanded down the top I discovered an oil stain… Not stain so much as an oil slick! I sanded off the stain and varnish; however, the oil did seep into the wood and now I’m afraid it won’t take a stain properly. Which means, I’m turning to y’all for help! Do I attempt to stain it? Do I break a cardinal rule and paint it? Do I paint it AND possibly go get an old gigantic map and mod podge the map on the drawers?!? What do y’all think? I’m taking any and all suggestions! I’m looking forward to the end result, too! It’s been too cold here to work on it and I’m ready for some sun! I love the map dresser! Very cool! Me too!!! I’ve started searching for vintage reproductions, because I like the old brown look of the older maps! I loved the group text! I would tell myself “keep doing it your way”! And I love that dresser! I love the mod podge ideas since it sounds as though it isn’t in the best of shape anyway. It will be stunning no matter what, I think. Thanks for commenting on my St. Patty’s Day blog post. Nice to meet you! Oh, I Like that “keep doing it your way”! That’s a good one! Wow1 All amazing ideas. Channeling your inner Pinterest. I loved the responses….and those dressers are stunning! Great job. 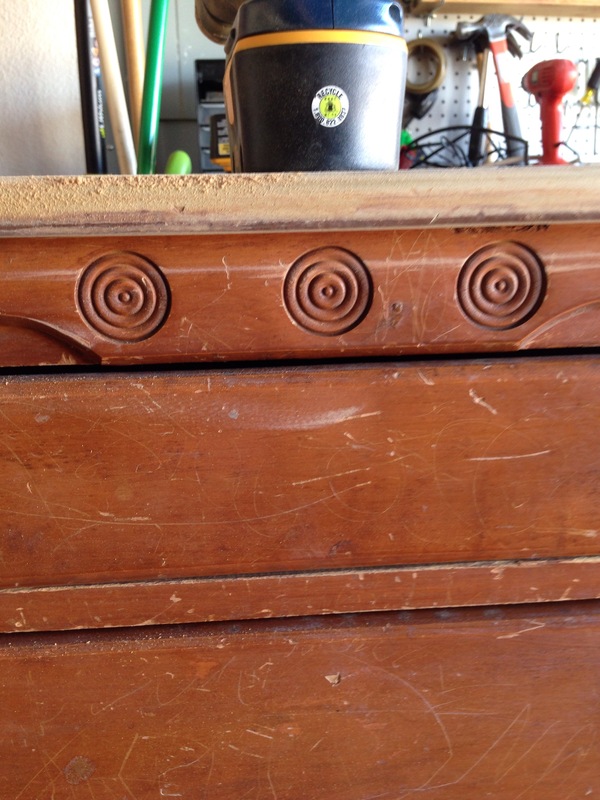 beautiful dresser — I like the wood grain showing. I’d put a light stain and just chalk up that oil discoloration to “character”. I love the idea of character showing through, too, Jeff, it helps tell the story of the piece! And those are great words for your teenage self, for us today, too!! Thank you for sharing that! I like it! love the 5 words and what your family came up with. That’s a well made dresser, love it. I have no advice though. I tend to be a painter but I do have one antique dresser I would never paint in a million years. Ooooo loved the group text! And I would totally tell myself their opinions don’t matter! Gosh, I still need to tell myself that at the age of 33!! You could try just staining the area in question and see if it takes. If not just sand it off again and paint it. I think I’ll do that! Because I’d love to be able to keep part of it original and not paint over it all! 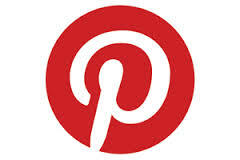 You may also want to try your local harware stores for knobs or ask a millwork place about them. hahahahaha!!! I so totally get that!! Dude, you are entirely awesome. You know what I’d do with something like that? Squat. I’d make all these plans for it, and then it’d sit in MY garage until MY grandkids came along and sanded it down and did something with it. Sad, I know. I offer only the truth. I love what you did with it. I do not have an eye for this stuff AT ALL so will leave it for people in the know. I love that 5 word letter though. Brilliant! Love that question! Mine would be – Try, You Can Do Anything. 🙂 I have no ideas for ya about your dresser but (a) it is a beautiful piece and (b) I have no doubts in your ability and look forward to seeing the end result! I love the map one! I do, too! I may have to start looking for a really large map! I also think it’s a really cool idea to replace one drawer with baskets- it looks so unique! and I’m over the moon, dwelling in the stars! Thank you so very much! You are always so encouraging, Kate. Blessings to you!! Oh I am never in love with white! Lol! I am more of jewel tones and a purest when it comes to antiques; however, since I have free rein on this piece I’m excited to see what speaks to me! Thank you! 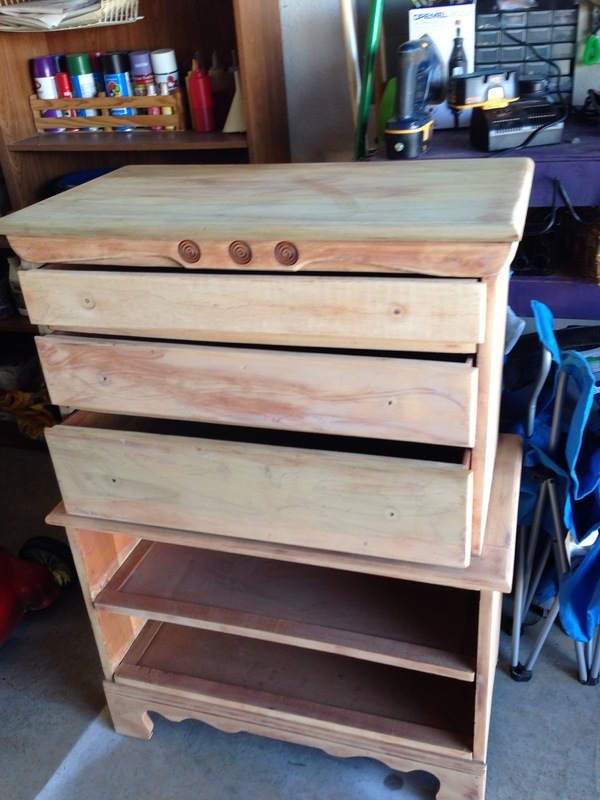 I’m excited to see what the dresser becomes! That is a great dresser! I love milk paint + some distressing to make it look like the paint has been there for years. That’s a great idea, and while I normally wouldn’t do that, with this piece I could! I can’t wait to try something new!! Great texts- 🙂 You can paint it, then sand/distress/ wax some of it down and throw the stain on top. That way you have a few variations in the color and it looks kind of weathered. Have fun! Ohhhhh, now that sounds neat! I never would have thought of that! Thanks Fallon! 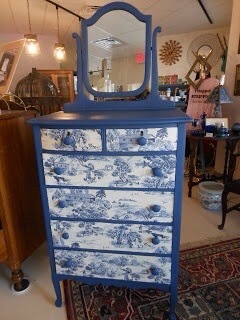 omg i loooove this dresser! that’s the dresser i’ve akways wanted!!! and i looove the idea with the maps on it! Thanks!! I am super excited about the dresser! And I love bringing a piece inside that lived outside for so many years… And I’m totally drawn to the map idea!!! 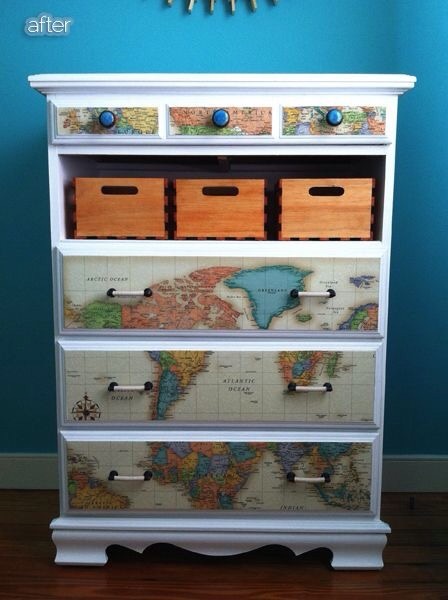 I’ve never done up an old piece of furniture but I do like the idea of maps on it! Lol! Love your letter to yourself! That’s funny and don’t tell Mr. T that there is time for both! 🙂 And I’m really drawn to the map idea, but there are so many neat things out there! 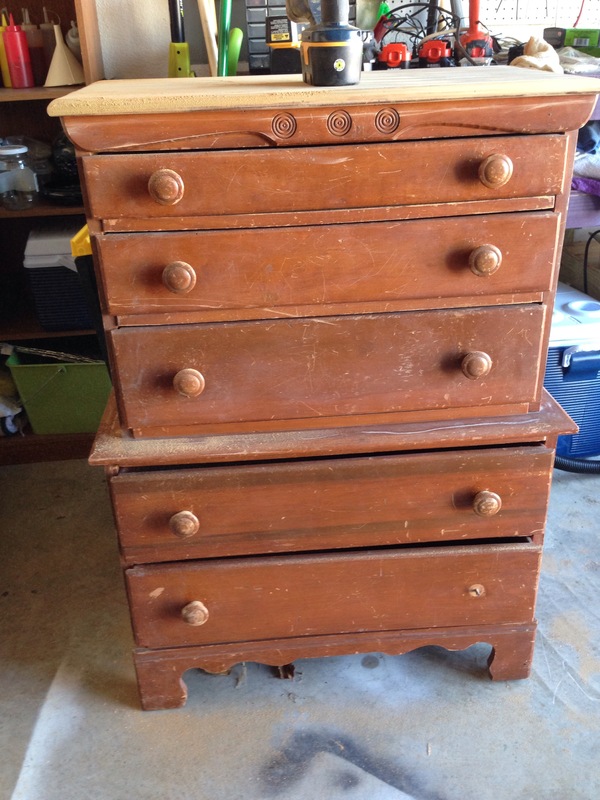 As for the dresser, I love wood but that map chest of drawers is pretty cool looking. Have fun deciding which way to go with it. Love your letter to your teenage self!! That is great, such good advice to ourself! I can’t wait to see what I do with the dresser, too 🙂 So excited! We enjoyed it, it was neat to see each other’s responses as we are all at different ages and stages! That is awesome, and since it’s not in very good shape, there isn’t any value except sentimental! I may have to try this, thank you! I don’t know about the dresser. What is cra cra? I know – I’m old. Car cra = crazy. He was fast on his feet to answer and cracked my sister up! do it! 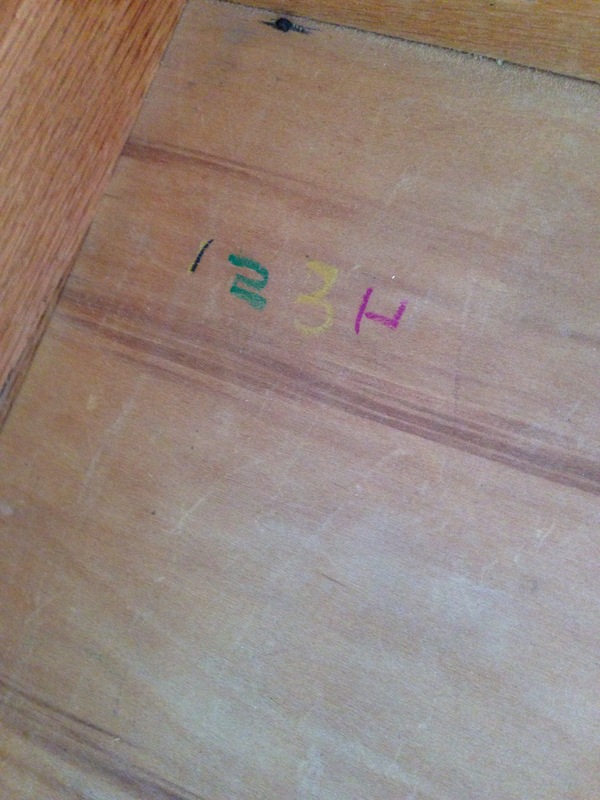 my husband and his older brother shared an old dresser as little boys that made it to our home a couple years ago (my mother in law left it on her carport for years, it desperately needed love). I ended up sanding, PAINTING, and taking several different wallpaper prints to the drawers. plus replacing knobs and such. it came out beautifully and now sits in our daughters room! the only thing I stained was the top of it. See, that’s what I want to hear! A real person that did it and had it turn out! Okay, I may have to start looking for prints, paper, etc., I think if I see it and it inspires me, then I can work with it 🙂 Thank you for letting me know! !